At the end of our Day Two, we all decided that we’d spend Day Three by exploring Hana. I was the only one in the family who had the opportunity to drive the Road To Hana (RTH) back in 1997 (nearly 20 years ago). 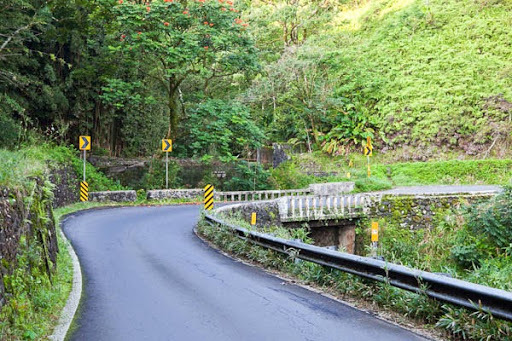 Driving the RTH is not about getting to Hana, but the journey as you make your way towards Hana. 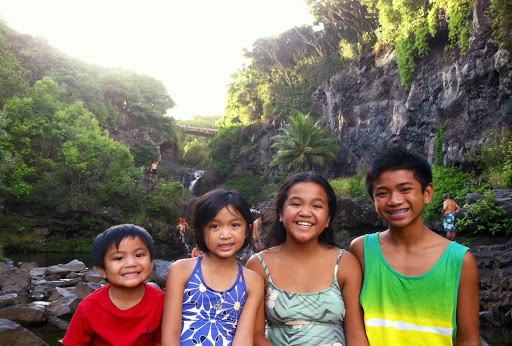 I had an idea what to expect (so I thought), which was why I told the family that we should leave our condo in Kihei around 6am (fat chance)! 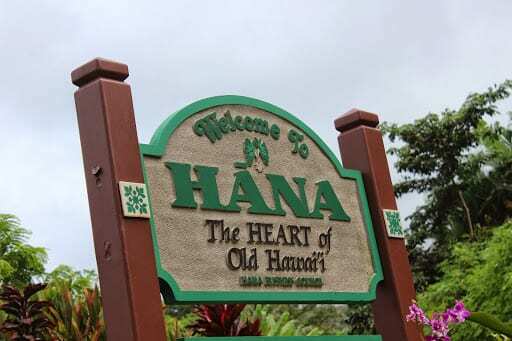 Plan A – Although we started late, and since we had 9 days on Maui, Nancy and I decided to go to Hana anyway, and see how far we could drive today, and if we decide to head back home halfway in between, we could do so and just return some other day. That way we’re not rushing ourselves. Plan B – Go and finish RTH all the way. I was leaning towards Plan B, but was game to do whatever it takes to visit this side of the island. 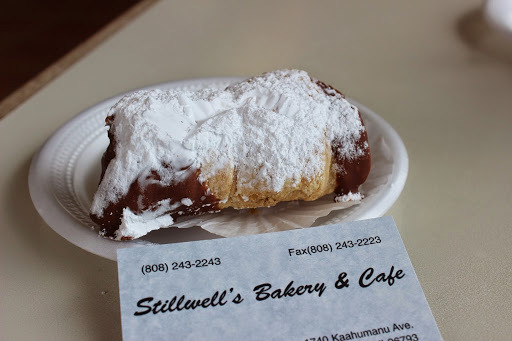 Since we had to pass by Kahului/Wailuku, I got a bit hungry (surprise, surprise) and decided to look at my foodie bucket list and realized that Stillwell’s Bakery was just a few minutes away. 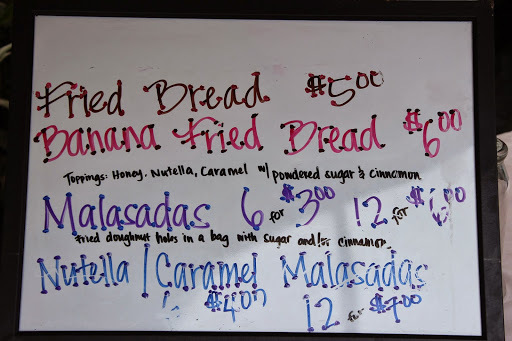 So we did a quick detour and headed over to Stillwell’s in Wailuku. I asked the lady at the counter what would she recommend? She said the Cream Horn (Puff pastry with custard and chocolate filling), and their Banana Cream Pie. We enjoyed both desserts. 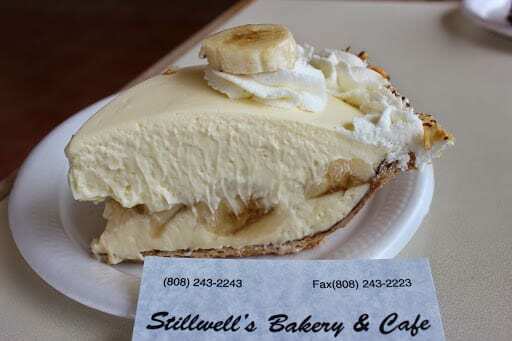 The pie had these big chunks of fresh bananas too. It was delicious. The cream horn was flaky, had a good crunch to it, and the cream was just right, not too sweet. Ok, so foodie craving was satisfied. Oh yeah….back on the road again. 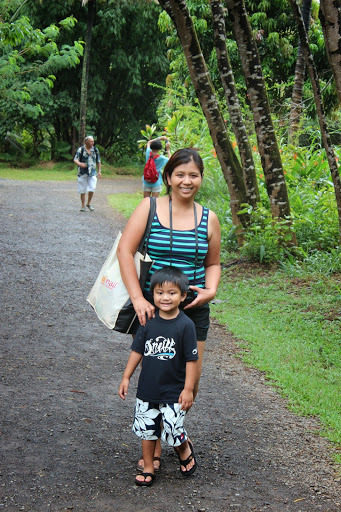 It was already past 10am when we finally made the trek leaving Wailuku towards the RTH. A little too late in my books. The weather at this time of day was cloudy with visible signs that these were gray cloudy rain clouds. But it’s Hawaii. 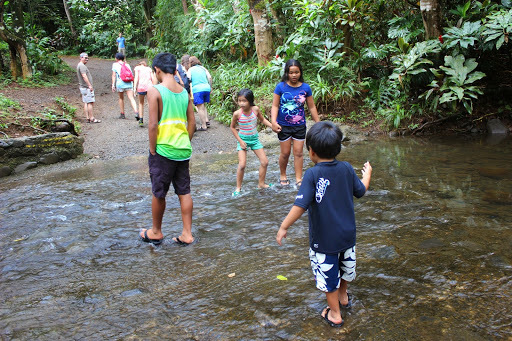 I did expect it to rain a bit, and I explained to the kids that Hawaii rain typically lasts for a few minutes. So I proceeded towards the RTH. If I only had a dollar…..
For every time the kids asked, “are we there yet?”, “where are we going, Daddy?”, “how much longer?”…..I’d be super rich! Again, I expected to hear all of these questions from the inquiring minds. They tried their best to keep themselves entertained (iPad, Kindle, Spotify, and random questions from mom and dad). sprinkled a bit, but we kept moving, Ethan and Madison were ahead, Caitlin and I were paired together, while Nancy had Evan. It was a beautiful rainforest, a great paved trail. There was a point where we actually had to cross a stream to get to the other side. Speaking of rainforest, it did rain. A nice heavy downpour for about 5 minutes. We took refuge under shady trees, but there was just no escaping the fact that we’d get wet eventually. After a few minutes, the rain ceased, and we walked some more. Not soon after, there it was, Twin Falls. At first, Nancy and Evan stayed from a distance by not getting any closer to the falls. After I made my way closer to the falls, I signaled and told her it was ok to cross. 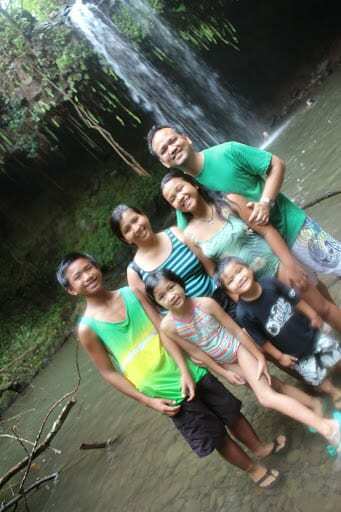 I met them halfway, and in no time, all of us were a few feet away from the falls. The walk/hike took just about over 1 hour roundtrip. We didn’t wear sneakers, it was just our Rainbow Sandals that saved the day. I don’t think the Beatles wrote this song about the RTH, but it was quite appropriate. All I kept thinking were the 600 curves/turns, and the over 50 bridges we had to cross. There were so many waterfalls in between that I simply lost track as to which waterfall was right in front of us. 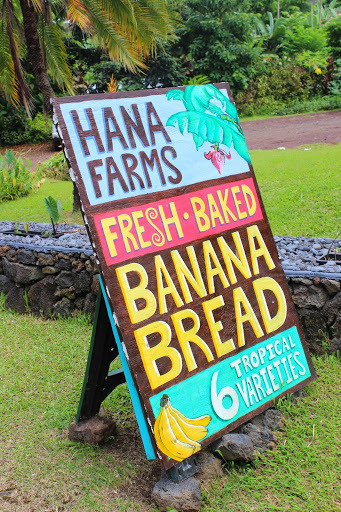 We did stop at the Halfway to Hana store. We had to get out and stretch for a bit. 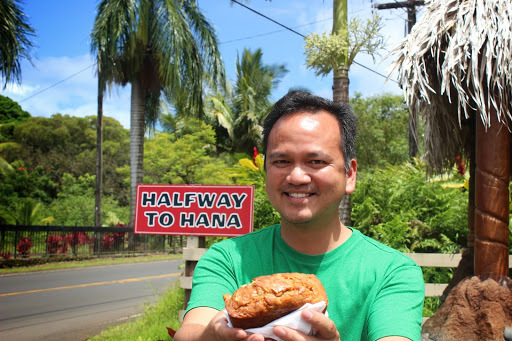 Ethan ordered shave ice, while Nancy and I shared a warm banana bread that just came out of the oven. Oh my! your ice-ness was the break we needed from The Long and Winding Road. It sure woke me up. It woke up my senses. Not long after, Ethan jumped and joined. 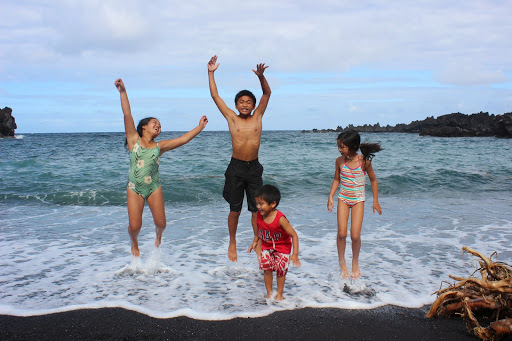 The 2 kids jumped in again, and again….it was that fun!!! 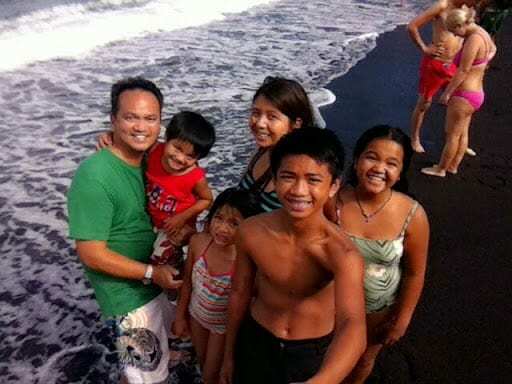 After a few minutes of playing in this cave ice bucket, we walked out and headed down to Black Sand Beach. It was just picture perfect. It was packed with tourists, but the beach was big enough to accommodate the crowd. It was already past 4pm and there was just no way we’d be turning back now. So after leaving Wai’napanapa, we finally arrived at Hana. We were very hungry at this point. 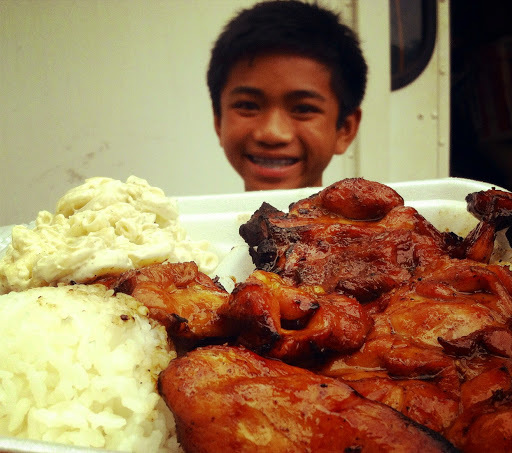 We stopped at Braddah Hutts BBQ a food truck off to the side of the road. We ordered the most delicious BBQ Chicken and Grilled Steak. We were on a mission to eat fast because at this point, we’ve not even seen the Seven Sacred Pools yet, considered one of the highlights when you drive the RTH. So we did what we could to eat quickly, but it was just wrong to do so. The chicken and steak were flavorful, and I was not expecting that from this little shack. It was amazing. Another family next to us enjoyed watching us devour our food. Hahahahahaha I don’t blame them. When I took the back road before, I do remember the “rocky road” and then I remember ending up in some nice residential area. That’s what I was expecting. After leaving the Seven Sacred Pools, we were back on the winding road, lots of rocky areas. Just imagine yourself sitting at a Brookstone and sitting on one of those massage chairs….it was rockyI Did I have appreciation for paved roads the moment we left the rocky/unpaved areas? You bet. As we drove out further, I thought’ we’d end up somewhere in Makena/Wailea area….but that was just too good to be true. The road took us to a long stretch of 1 to 2 skinny lane paved highways, via cattle farms, and near the foot of Haleakala. It was a long way home (probably took us close to 2 hour). We got home past 9pm, and as you might imagine, we were exhausted. I am just glad that we did the RTH and with 4 kids in tow, we tried to take in as much as we could with so little time. 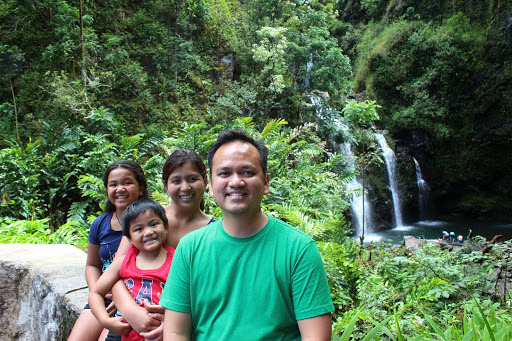 Road to Hana is now crossed off our Maui bucket list. What kept us entertained? The kids of course. Caitlin had a craving for chips, so she asked for “TORTATO” chips (we thought she wanted Potato chips). Come to find out she was referring to TORTILLA chips. She couldn’t pronounce TORTILLA (pronounced TOR-TEE-YAH), instead, she kept saying TOR-TEE-TA. That took about 15 minutes which gave us a good comic relief during this strenuous drive. Ok….that was the very exhausting, yet rewarding Day 3….good night….and mahalo for following our journey.